I've been waiting patiently to try one of these before plunking down some serious dough for the set. I have always wanted to own the set because... 1. They are made in the USA. 2. They look good. and 3. Some have said the views are better than Zeiss and the Supermojos!! I attend at least 1 star party a month and the story is always the same... "You don't happen to have a Brandon eyepiece in that case do you?" . "Never heard of them... Are they nice??" or "I have a friend with a few, but he's not here tonight.. "
So far, to me it seems these eyepieces are as rare as their users. So , you need to try one. That's a good idea before the purchase a very good idea. 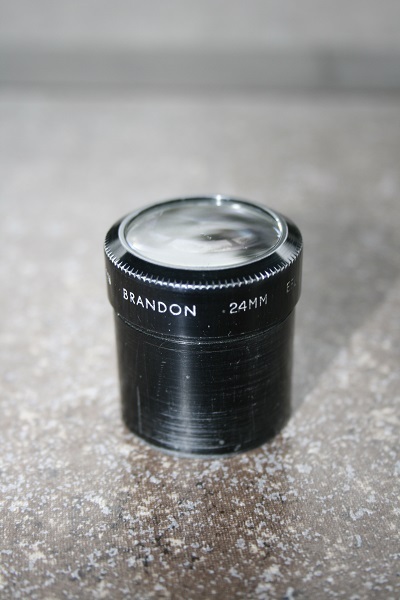 Someone started a thread that called the Brandon 48mm a legendary eyepiece , some would call the same eyepiece a legendary horror story. You may very well find the 8mm a fine eyepiece on the planets and double stars . Brandons are good, a personal fave of mine, for grab and go or deep meditative sessions. 6mm, 8mm, 12mm, and 16mm I find particularly appealing. Just a word to the wise - do not inflate your expectations too much. They will, at a casual glance, appear to offer little in the way of gain over a typical ortho or plossl (which are far cheaper at retail). After a while, once one get used to their nuances, I find that few eyepieces are better for planetary observing than these. They are pretty much my staple - in a long focal length refractor or mak, they do a really good job. Do not be too concerned how they stack up against some other heavyweights that would likely cost twice or three times as much used - it is ultimately irrelevant. What is relevant is that if you can try before buy, do so. Give them a proper day in court. Edited by Martti, 04 February 2015 - 03:53 AM. My suite of pre-50th and 50th anniversary Brandon's helped me go thru the H400 and fainter list in my f/5.7 Petzval. Unless you regularly experience the steadiest of skies I can't imagine any significant planetary difference with any other top shelf eyepiece. My Brandon 48mm is a classic example: Ideal for my f/10 SCT, not for my f/4.6 Dob; superb on extended objects like the double cluster, so-so on things like double stars. All in all, I think Brandons are in the upper 25 percent of eyepieces, bumping up against the numero unos like Televue and Docter and a cut or two above Explore Scientific, Vixen and some others. They would not have endured this long essentially unchanged, or be as widely discussed here, if they were not very good to excellent oculars. I hope you will post your impressions when you do get a chance to use one or more of them. Keep in mind that they barlow very well. I use the longer focal lengths combined with a 3x barlow for planetary viewing. I've never heard or experienced any horrors with the 48mm. It is not much different in the "horrors" department than any 4-element, long focal length 2" eyepiece. Now I wouldn't put it in an f/4.5 Dob expecting great things from it as a finder eyepiece, but even at f/7 it's as good off axis as any 50-56mm Plossl or Symmetrical I own. Used rationally, what's so frightening? The 8mm is decent, but the 6mm is better still for planets and double stars. I'd love to have a modern-glass 4mm too. Instead I have a Chester-built 4mm, which is the one dog in my Brandon pack. I'd pull a year or two of A-Mart listings, and use them to lowball these sellers (who IMO are priced quite high based on the comps). ~$100-$130 is a good price for well-cared for, unmarred, newer units. $150 for as new, never used. IMHO. Edited by jrbarnett, 04 February 2015 - 12:46 PM. Good advice in general, especially for the more expensive glass. Thanks for the tip Jim. I would usually go this route, but since you and some other's have spoken so highly of this eyepiece I would want the entire set in a Walnut case. Only after being able to try one out of course. Ah, yes. 5-6 eyepieces lined up in quiet repose. 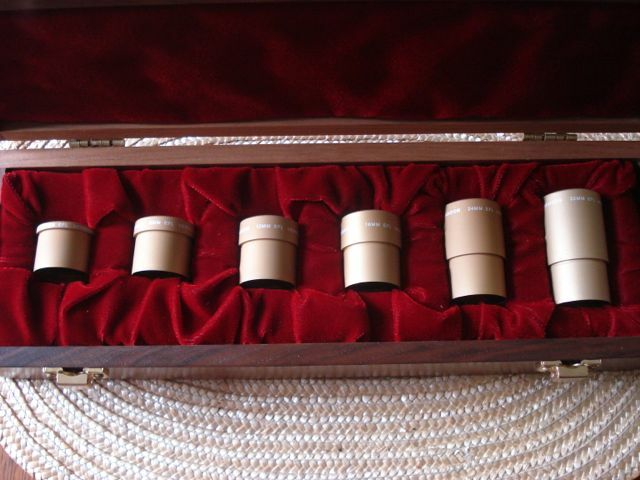 Their velvet lined box opened as if lying in state. They're at rest now. Bless them. Ah, Brandons. My favorite bino eyepieces, in particular the flat tops. Super duper light and practically as easy to change out as to use a Powerswitch, with no weight shifting like those big heavy green-lettered things. My 16mm are on par with my ZAO-IIs. Its nice they are back in favor, I remember a few years ago where the mere mention of Brandons would start an unholy war and the word "Brandon" was actually banned from CN for awhile because it stirred up such controversy. They are brilliant little jewels. Edited by johnnyha, 04 February 2015 - 04:00 PM. Well, it made a great drinking game too.....Brandon-----Drink! Only one I got is a 16mm from the Chester Brandon era, preVernonscope.....nice in my f9.8 frac. Haven't tried it in my dob, though that'd be like using a hammer when you need a screwdriver. In the frac though----Yum! Finally, a Brandon thread of useful and concise advice! I have the 50th anniversary set as well as the 48mm and they are my go-to eyepieces. I like them so much I only have longer focal length scopes to use them in. In very good scopes of f/8 or longer, they are superb. In shorter focal ratio scopes they work well, but the longer f numbers really make them shine! My 24mm has been in the focuser 4-5 times when someone has told me that the view of a target was the best they have seen. In 1977 my Mak was advertized as coming with the 16mm UO Konig, when I received the telescope eleven months later it came with a 24mm Brandon. I love that eyepiece, I use it in that 6" f/15 Mak on stuff like M13 and M42. Even after dropping it years ago in my unpaved driveway and scratching it, I still like it on those M objects better than my 25mm Clave. I don't have any of the popular wide field eyepieces, just an old 55mm UO 2" plossl and a 2" 70mm Paul Rini , but If it fits, I always use the 24mm Brandon for my deep sky observing, its been that way for a long long time. Edited by A6Q6, 06 February 2015 - 11:55 AM. They are so light it's amazing! The barrel fit's in the diagonal like a glove. Yeah they are expensive but worth trying as they move really fast if you decide they are not for you. I have a 16 and 32mm now for for 30 yrs. and a few dings on them from dropping on the patio...ouch but still work fine. BTW....I don't know why, but on the moon they are fabulous and call them my moon EP. I had that same size EP but was 32mm and gave that "floating" feeling. It was dropped once to many and had to be replaced with the longer barrel...wish I still had the shorter one...cool looking EP! I currently have sets of antares elites,tv radians and brandons. Those are accompanied by some nags,delos,orthos,pentex xls and es pieces. When I'm using my cat and want the most planetary detail I can see,the 12mm brandon shines. Not an earth shaking difference but rather more subtle improvement in details and tones when compared to the orthos,radians or delos. It, followed by the 8mm, are the most used of my brandons. I was about to post a 'quikie' review of the Brandon 24 (new version). I bought this in 2008 from Brandon after reading all the glowing reviews here on CN. When it first arrived I was using an f15 Mak and a TOA130. It was pretty nice, but nothing special in the TOA. It was rubbish in the Mak. 'Suckeeeerr" I thought and chucked it in a drawer vowing to never believe an EP review again. Maybe I could flog it, or give it away and hope for the best. I quickly forgot all about it. It re-surfaced last week while having a cleanout and I thought I'd give it one more chance and popped it in an LZOS lensed 80mm, not expecting much. It's spectacular! I mean really spectacular. It even outshines one of my top 3 EPs - the 24 Panoptic! Last night I plonked in in a neighbour's f4 Newt using the correct Paracorr settings. Same result. So I thought I'd give it a go in my f6 Apo. spotter- a very unforgiving scope- just to see how it'd fare in the bright of day. Except on the nearest objects (the cat, the garden, stampeding sheep ) it presents a beautiful, clear, flat field with lots of "bite" and no kidney-beaning, blackouts or any other optical nonsense: something only of which my TVs and Tak eyepieces are capable. And they cost twice as much or more than the Brandon. To summarise. In a relatively fast scope, say f7 to f4, (the only scopes I've tried it in), this is absolutely the mid-range EP for you. On my old 16mm, It doesn't fit into all 1.25" adapters. It fits in the "screw" type adapters, but I had to try a couple of other adapters with the collars before I found one it would go into, and it was a tight fit then. It didn't fit into the adapter that came with the Orion dielectric diagonal at all, not even close. This is the first eyepiece I've had that was that finicky about adapters. But the views are fantastic in my f9.8 frac. Edited by csrlice12, 04 February 2015 - 09:01 PM.